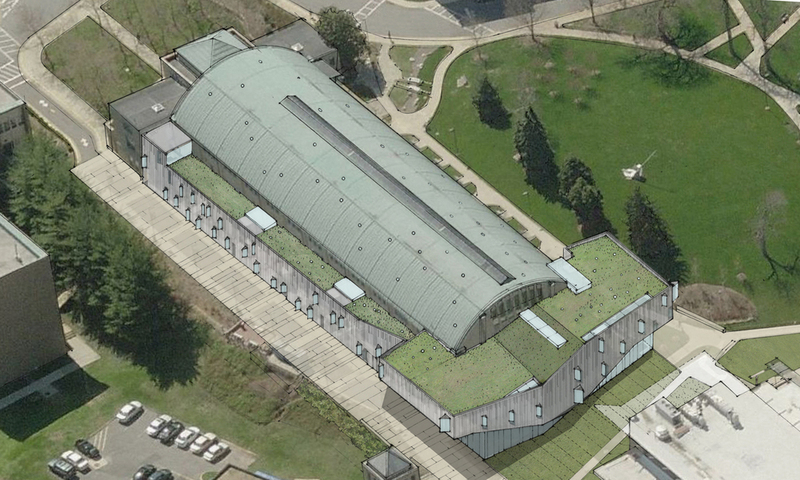 This winning entry in an invited competition to renovate and expand the existing Edward M. Crough Center builds on the trajectory initiated by the School of Architecture and Planning to cultivate their existing historic building while accommodating expanded studio, faculty and exhibition space. Due to the development of new graduate programs and a substantial increase in numbers of the students and faculty, the school finds itself exceeding the ability to fit within the boundaries of the original Old Gym. LTL's approach to this project is to strengthen the underlying design imperative of the 1989 renovation that placed the studios as a shared resource at the heart of the school. The design creates new strategic additions to the north and east of the Old Gym that accommodate faculty offices, a relocated lecture hall, exhibition spaces, pinup areas, classrooms and fabrication spaces. By consolidating these functions in the new additions, the design studios are able to be accommodated within the main exposed trussed drill hall of the original structure. At the same time the design establishes a new entry and sequence of public spaces at what was formerly the rear of the building, engaging evolving pedestrian circulation patterns and establishing a connection to the broader campus landscape.